Sylvia Marie Leonard, 94, of Fostoria, passed away at 6:25 a.m. Tuesday October 30, 2018 at the Bridge Hospice Care Center, Bowling Green. She was born December 22, 1923 in Tiffin to the late Clifford E. and Clara M. (Dolch) Creeger. She married Charles Robert Leonard on April 12, 1942 at the First Reformed Church (now Grace United) in Fostoria and he died on February 25, 2011. Surviving is a son, Terry (Sharon) Leonard, Fostoria; grandson, Bryan (Marla) Leonard, Findlay; granddaughters, Julie Johnson, Blacklick, Ohio, Angela Sheets, New Albany, Indiana; two great-grandsons, Seth Leonard and Austin Sheets, and two great granddaughters, Abigail and Allison Sheets; 3 step great-grandchildren, Kayce, Kollin and Regan; and a sister, Virginia Below, Pemberville. She is also preceded in death by a daughter, Susan Johnson. Sylvia was a 1941 Fostoria High School graduate. She was employed by Autolite as a purchasing and accounting clerk, retiring in 1983 after 21 years of service. 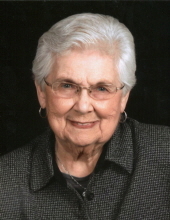 Sylvia was a lifelong member of Hope Lutheran Church, Fostoria where she taught Sunday school, served as a deacon, sang in the choir and was a funeral dinner chairlady. Sylvia also volunteered at the Sharing Kitchen, Bureau of Concern, Fostoria Hospital Gift Shop, Good Shepherd Home, and Meals on Wheels. She enjoyed sewing, knitting and keeping up with her family genealogy. A memorial service will take place at 11:30 a.m. Wednesday November 7, 2018 at Hope Lutheran Church, Fostoria with Rev. Dr. Larry Knigga, presiding. Visitation will take place 2 hours prior at the church starting at 9:30 a.m.
Burial will follow at Fountain Cemetery, Fostoria. Memorials are suggested to the Hope Lutheran Church, Good Shepherd Home, Bridge Hospice Care Center or a charity of the donor’s choice. Arrangements have been entrusted to Mann-Hare-Hoening Funeral Home, 407 N. Countyline Street, Fostoria. To send flowers or a remembrance gift to the family of Sylvia Marie Leonard, please visit our Tribute Store. "Email Address" would like to share the life celebration of Sylvia Marie Leonard. Click on the "link" to go to share a favorite memory or leave a condolence message for the family.